We have reserved processing dates in March at Hudson Meats in Hudson, South Dakota, for the group of pigs we are currently raising. We add a 2.5 cubic foot bag of wood shavings to their bed pack every other afternoon. Some of it gets dirty and removed, but over the past two weeks, they have piling it and moving it around vigorously. It’s a big bed-making party: they pile on next to each other and trade places, and when one gets bored and makes a certain noise the whole cycle starts over again. 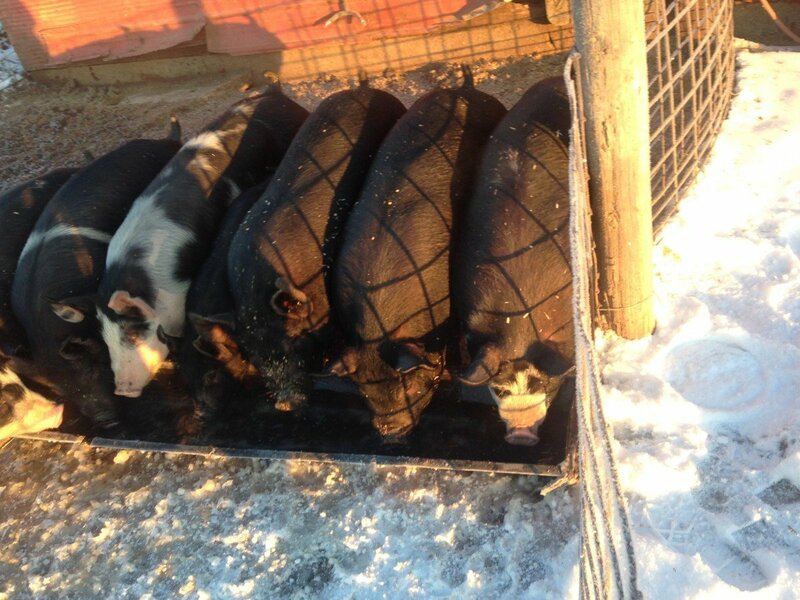 These pigs live in the barn but have unlimited access to the outdoors. They seem to be enjoying the winter! Once they settle down you can hear them snoring. When you get accused of snoring like a pig, it means you are making a LOT of noise. In the morning when I bring the hens water and check on the pigs, there is steam raising from their nest. We are taking deposits on these pigs. A $100 deposit will hold a half. A half is usually about 100 -110 pounds carcass weight; how much weight you end up with in finished meat depends on how you would like it processed. Your half will be custom processed for your needs. The final cost is $1.95 per pound hanging weight plus processing costs. Contact John via Facebook or mobile (712-490-8218) to reserve a half or whole. We have been feeding the pigs winter squash that are no longer presentable for sale. If I break them in half they grab pieces and take them to a corner to eat. They love a little diversity to their diet, it must be like having dessert!